National Immunization Awareness Month is a reminder everyone needs vaccines throughout their lives. From the moment you found out you were pregnant, you started protecting your baby. You might have changed the way you eat, started taking a prenatal vitamin or researched the kind of car seat to buy. But did you know that one of the best ways to start protecting your baby against serious diseases is by getting flu and Tdap vaccines while you are pregnant? The vaccines you get during your pregnancy will provide your baby with some disease protection (immunity) that can last during the first months of life after birth. 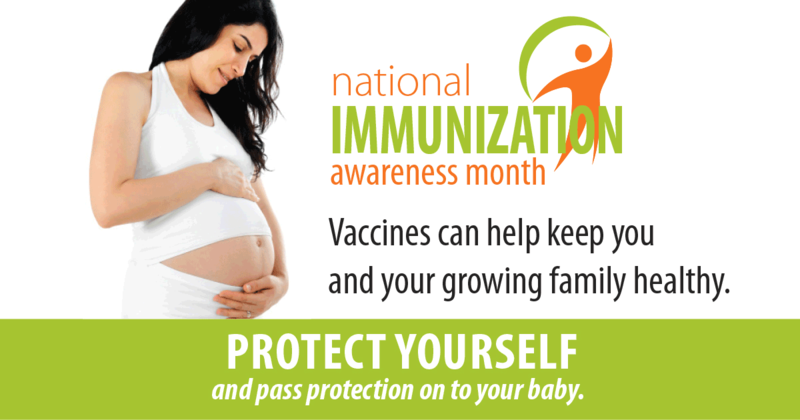 By getting vaccinated during pregnancy, you can pass antibodies to your baby that may help protect against diseases. This early protection is critical for diseases like flu and whooping cough because babies are at their greatest risk of severe illness from these diseases in their first months of life, but they are also too young to get the vaccines against these illnesses. Passing maternal antibodies during pregnancy is the only way to help directly protect them from flu and whooping cough (pertussis). In cases when doctors can determine who spread whooping cough to an infant, the mother was sometimes the source. Once you have protection from the Tdap shot, you are less likely to spread whooping cough to your newborn baby. When it comes to flu, even if you are generally healthy, changes in immune, heart and lung functions during pregnancy make you more likely to have a severe case of the flu if you catch it. If you catch the flu when you are pregnant, you also have a higher chance of being hospitalized. Getting a flu shot will help protect you and your baby. You can rest assured these vaccines are very safe for you and your baby. Millions of pregnant women have safely received flu shots for many years and CDC continues to monitor safety data on flu vaccine in pregnant women. The whooping cough vaccine (Tdap) is also safe for you and your baby. Doctors and midwives who specialize in caring for pregnant women agree that the whooping cough vaccine is important to get during the third trimester of each pregnancy. Getting the vaccine during pregnancy will not put you at increased risk for pregnancy complications. You should get your whooping cough vaccine between your 27th and 36th week of pregnancy, preferably during the earlier part of that period. You can get a flu shot during any trimester. You may receive whooping cough and flu vaccines at the same time or at different prenatal care visits. If you are pregnant during flu season, you should get a flu vaccine as soon as the vaccine is available, by October if possible. If you want to learn more about pregnancy and vaccines, talk to your ob-gyn or midwife, and visit https://www.cdc.gov/vaccines/pregnancy/pregnant-women/index.html.